Part of Key West’s charm is its colorful history and quirky characters who’ve shaped the island into what it is today. 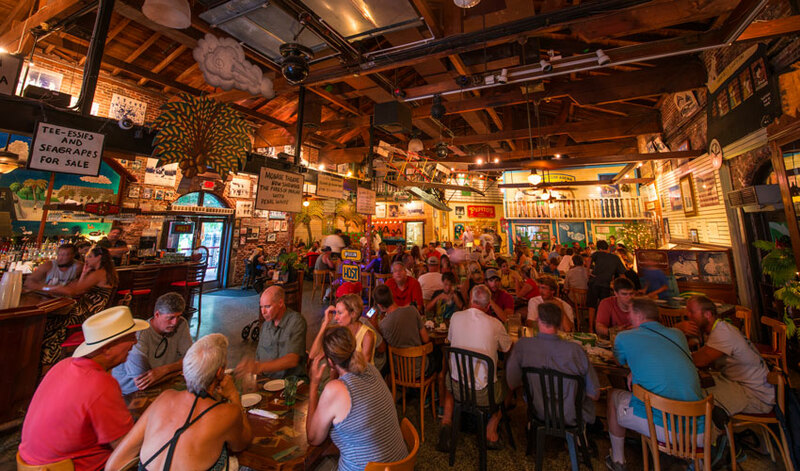 Get a taste of the past at Key West’s most historic and iconic restaurants. Pepe’s, founded in 1909, is the oldest restaurant still operating in Key West today. Locals and visitors love it precisely for that, its Old Florida charm set in a cozy backyard on Caroline Street. But that’s not the only draw; the food is as close as it gets to Florida home cooking. Breakfast is popular here with massive omelet and French toast specials, plus hand-squeezed orange juice makes screwdrivers or mimosas incredibly refreshing. Lunch and dinnertime calls for grilled mahi sandwiches or grouper specials. Sloppy Joe’s is one of the most storied restaurants on the island. Today, it’s famous for raucous parties, live music and late nights on Duval Street. But this bar actually originated in 1933 around the corner on Green Street in a space currently occupied by Captain Tony’s Saloon. This was where Ernest Hemingway spent many evenings after fishing on his beloved boat Pilar. When owner Joe Russell moved his bar to Duval Street in 1937, Hemingway carried one of the urinals from the Green Street location back to his home on Whitehead Street and turned it into a fountain, which you can still see on a tour of the home. Today, Sloppy Joe’s is a great spot for lunch with live music. And for even more entertainment, catch the annual Hemingway lookalike contest every January. One of Key West’s top fine dining restaurants is also one of the most historic. A&B Lobster House looks out on the Historic Seaport from a second floor perch with a lovely balcony. A white tablecloth establishment, diners love A&B for steak, lobster, fresh caught seafood, a spectacular wine list and perfectly mixed martinis. Founded in 1967, Two Friends Patio Restaurant is a casual, family-owned open-air spot on a sprawling patio on Front Street. The mood is relaxed and easygoing in a location where you can watch the world pass by on the sidewalk outside. Two Friends serves fresh seafood, like local shrimp, fish, lobster, oysters, conch and crab. They also have a great menu of steaks and delicious frozen drinks to wash it all down. Louie’s Backyard is another classic Key West restaurant with some of the best food on the island and one of the loveliest settings. Off the beaten path on the Atlantic Ocean side, Louie’s is set in a historic Victorian mansion with a beautiful tiered deck leading down to the water. The menu at Louie’s is a creative, upscale twist on Floribbean fare, like miso-glazed yellowfin tuna or grilled swordfish with olives and fennel salad. Come for sunset cocktails at the After Deck bar on the water or try the Upper Deck upstairs for lighter tapas-style fare. A mainstay at the Historic Seaport since 1972, Half Shell Raw Bar is a down-to-earth, open-air spot filled with picnic tables, and buckets of oysters, clams, peel-n-eat shrimp, crab legs and mussels waiting to be shucked. For anyone craving fresh raw bar fare in a laidback setting with water views, Half Shell is the place to go. Of course, Key West’s ties to Cuba run deep and classic Cuban fare can be found at El Meson de Pepe right in Mallory Square. Our restaurant first opened in 1985 on upper Duval Street and then made a move to its current location in 1997. From a Cuban mix sandwich to ropa vieja with black beans and rice, El Meson de Pepe is the place for authentic Cuban cuisine. Don’t forget to try the mojitos! Check out this unique Key West restaurant complete with live music and delicious bar food for a rocking good time. As they say, Hog’s Breath is better than no breath at all! This funky indoor-outdoor bar-restaurant is decked out with license plates lining the walls and a rowdy scene. Whether its’ the world famous hog dog or one of the best rum punches on the island, you’re guaranteed to have a good time at Hog’s Breath. You’ll also find some of the best musicians on the island here. Blue Heaven is a Key West modern classic. Founded in 1992 by Suanne and Richard Hatch in Bahama Village, the place really is a little slice of heaven. Expect a wait of at least an hour for weekend brunch as this place doesn’t take reservations. The wait is worth it though for banana pancakes, lobster eggs benedicts and the best Bloody Mary’s on the island. The backyard setting with an eclectic assortment of painted wooden tables shaded by palm trees and ship’s sails is positively dreamy. There’s a free-standing bar, ping-pong tables and often live music for entertainment. Dinner is delicious with jerk chicken and Caribbean BBQ shrimp, and don’t forget to order a slice of key lime pie with mile high merengue for dessert.